Background: Surgical skills training has become an integral part of general surgery residency programs. However, there remains no consensus as to what should comprise a mandatory curriculum. Further, defined practice or proficiency requirements designed outside of the 80-hour work week have not been established. For this study, a mandatory, at-home laparoscopic skills curriculum was implemented utilizing the TASKit portable laparoscopic box trainer (Cincinnati, OH). The objective of this study was to quantify the adoption of a take-home skills training curriculum as well as to determine if utilization of a take-home box trainer improves laparoscopic skill compared to a validated task. Methods: All PGY levels of an ACGME accredited surgical residency program were provided with a portable, self-practice laparoscopic box trainer from December of 2008 to September of 2010 (n=26). 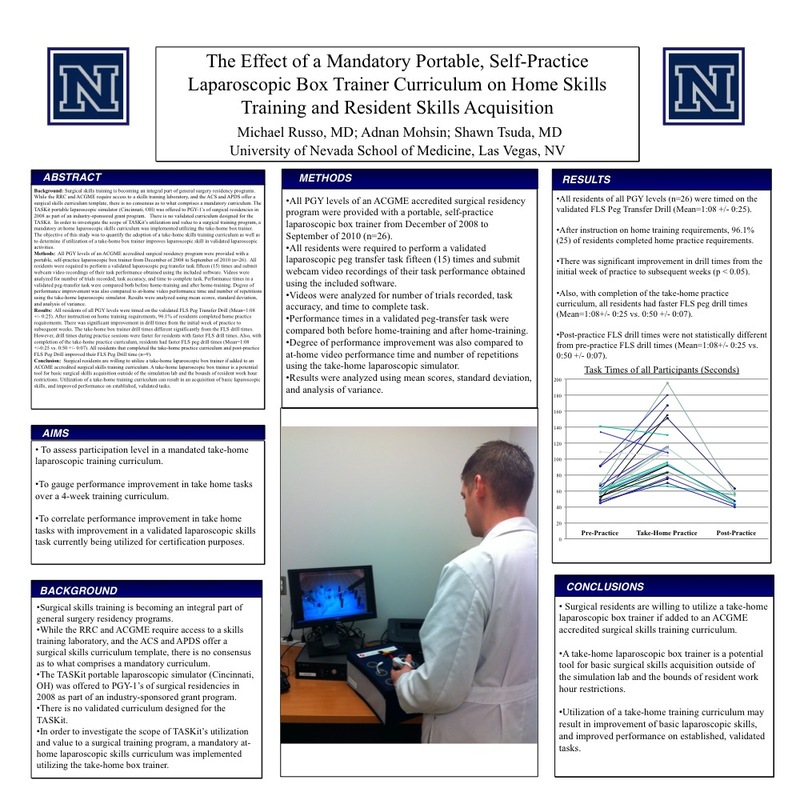 All residents were required to perform a laparoscopic peg transfer task fifteen (15) times and submit webcam video recordings of their task performance obtained using the included software. Videos were analyzed in blinded fashion for number of trials recorded, task accuracy, and time to complete task. Performance times in the validated Fundamentals of Laparoscopic Surgery (FLS) Peg Transfer were compared both before home-training and after home-training. Results were analyzed using mean scores, standard deviation, and student’s t-test and analysis of variance. Results: All residents of PGY level 1 through 5 (n=26) were timed on the validated FLS Peg Transfer (Mean=1:08±0:25). After instruction on home training requirements, 96.1% (25) of residents completed home practice requirements. There was significant improvement in drill times from the initial week of practice to subsequent weeks. The take-home box trainer drill times were significantly slower than the initial FLS drill times (1:51±0:34 vs. 1:08±0:25, p=0.001). Residents with faster take-home drill times had correspondingly faster FLS post-practice times. All residents that completed the take-home practice curriculum and post-practice FLS Peg Drill significantly improved their FLS Peg Transfer time (1:00±0:13 to 0:50±0:07, p=0.006). Conclusion: Surgical residents may be willing to utilize a take-home laparoscopic box trainer if it is made part of their surgical skills curriculum by program director’s mandate.. A take-home laparoscopic box trainer is a potential tool for basic surgical skills acquisition outside of the simulation lab and the bounds of resident work-hour restrictions. Although different from the validated FLS task, the take home box trainer demonstrates notable skill acquisition potential. Utilization of a take-home training curriculum can result in an acquisition of basic laparoscopic skills, and improved performance on established, validated tasks.